At the top of the list for me to review was an organic veg box delivery scheme. It’s been one of those things I’ve had on my “must try” list for years – probably ever since they were first invented! Organic fruit and vegetable boxes are a great way to introduce more of the good stuff into our diets…not only do they encourage us to eat more fruit and vegetables, but they are the very best fruit and vegetables…fresh from the farm, free from pesticides and chemicals, grown for flavour not cosmetic perfection. Not only are organic fruit and vegetable boxes good for providing good quality, healthy fruit and vegetables, they also encourage us to eat more seasonally and, thanks to tie-ins with local farms, to eat more locally and support local farmers too. All good and positive things that many of us aspire to do. 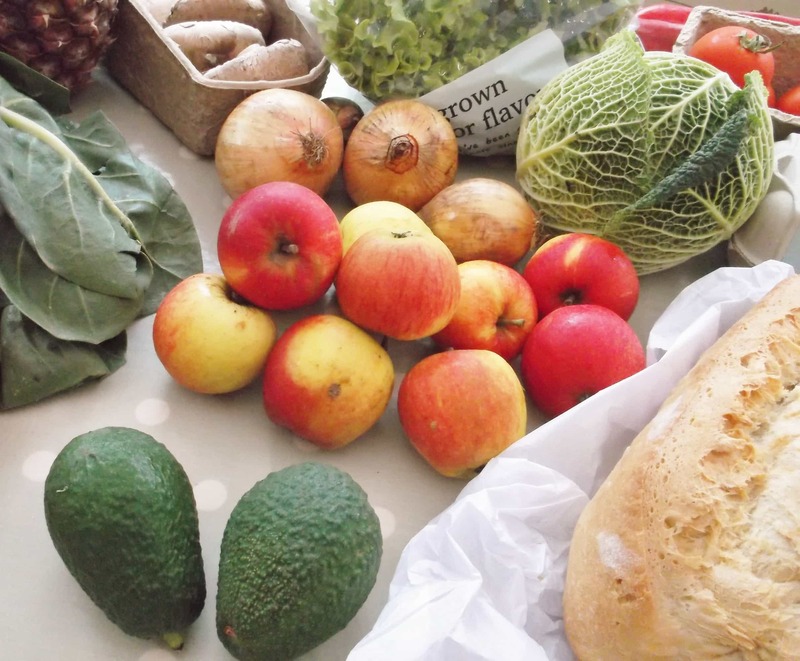 I was particularly spurred on to try an organic fruit and veg box after watching Hugh Fearnley Whittingstall’s wonderful documentary: Hugh’s War on Waste. One of the things he highlighted was the waste that is produced because of some supermarkets’ stringent quality requirements: he showed farmers having to throw away perfectly good produce because it was a bit wonky or the wrong size. He even showed a massive pile of wonky parsnips that were destined to be thrown away because their faces didn’t fit. It seemed such a sad waste and a scenario that’s not going to happen if you are buying directly from the farm. After a little bit of internet research, I chose to order a box from Riverford Organic Farms: mostly because I liked their clearly laid out and easily navigable site, which answered all of my many questions, such as: “Do you deliver to my house?” and “What day do you deliver?” I also liked the way you could see, on one page, all the different possible boxes…I had no idea there would be so many to choose from: fruit boxes, veg boxes, salad boxes and even organic meat boxes. There was also a handy guide as to what sized box to buy for the number of people in your family. Riverford’s site is clearly laid out and easily navigable. 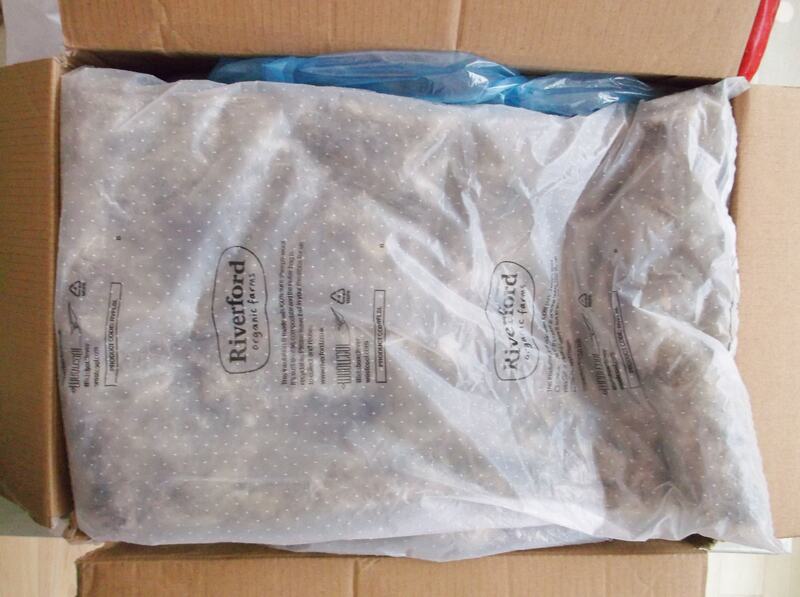 The first thing I wanted to know was whether Riverford delivered to my house and what day they delivered. I found clear instructions about how to do this in the FAQs and was able to quickly type in my postcode to get the answers which were: yes and Fridays! I liked the fact I didn’t have to log in to find this out. Next I had to decide what to buy. This was more tricky as there is a lot of choice: you can buy everything from a small veg box, containing 4 different vegetables, plus staples such as potatoes and onions, to a large fruit, vegetable and meat box containing a whopping 7 different vegetables, 3 different fruits and 3 different meats. Helpfully there is a handy guide which tells you what each box contains for the coming week and another which suggests what size box to buy for the number of people in your family. Since I wanted to give the scheme a really good and comprehensive review, I opted for the large fruit, veg and meat box (£47.80) plus a salad bag (£7.25). 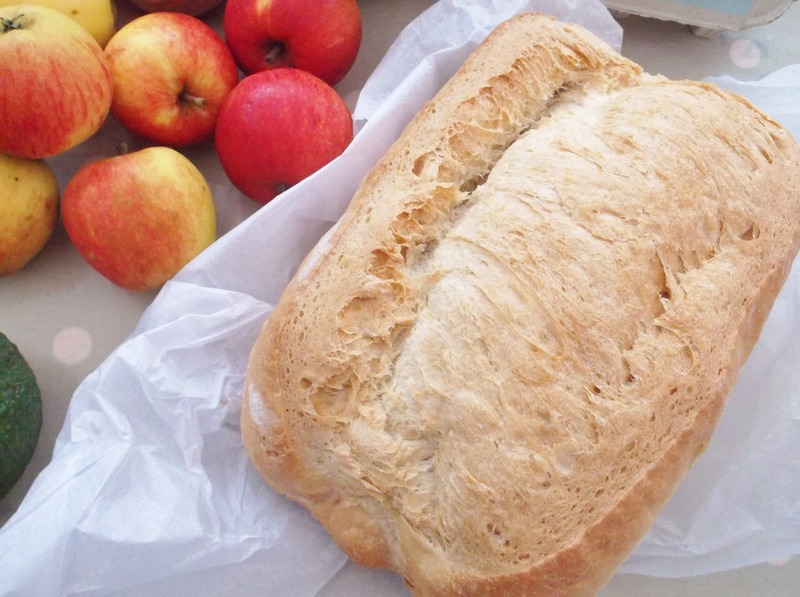 There are also plenty of other things you can order on the site to add to your order: from breads and store cupboard staples to sweet treats and even a marmalade making kit. 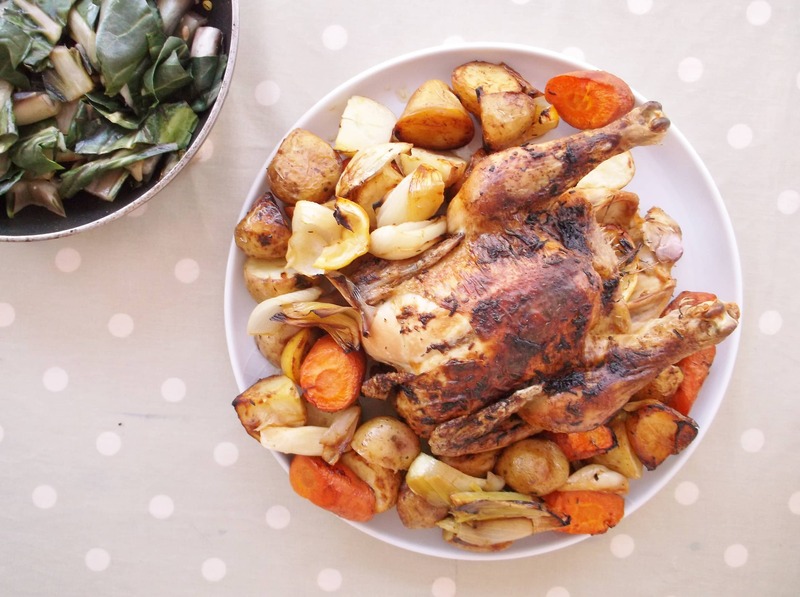 In fact you could probably do your whole weekly shop from Riverford if you wanted to. I decided to add a couple of extras to my order and bought a large loaf of bread (£2.39) and 6 eggs (£2.25). Once I had decided what I wanted the rest of the process was quick and simple. A straightforward internet transaction that took less than 5 minutes – much quicker, in fact, than my usual supermarket internet shop. My box was duly delivered at 8am the following Friday by a nice man who made my son’s day by asking him to carry one of the (lighter) boxes. Before my box arrived, I had been a little concerned that it might be delivered while I was out and so wrote in my delivery instructions that it ought to be left with a neighbour if I was out (apparently this is all quite normal and you can opt to have your box left with a neighbour, put in a safe place or delivered to your work address) but fortunately I was in when my Riverford man popped round so it was all ok. In fact, he delivered our boxes when the kids were still here which made them super excited. And it was great to be able to talk to them about how this produce was “straight from the farm”. One nice feature of Riverford is that they have their own local delivery people, rather than using couriers. In fact the service is so good, you even get the phone number and email address of your delivery person when you order, should you need it. It also means you get the same person delivering your order every week, making it a lovely personalised service. Delivery is also free, which is a bonus. I am used to having my shopping delivered and so it was not much different to my normal supermarket delivery except that it was free! It also well packaged in boxes you can keep, meaning I didn’t have to unpack it all straight away which was great, as I needed to get the kids to school. I just popped the meat into the fridge and left the rest until I was back from the school run. Actually, I was really impressed by the packaging. All of the fruit and veg came in a nice sturdy cardboard box, the bread came in its own little paper bag, as did the salad and the meat was packed in a clever box that was insulated using wool. 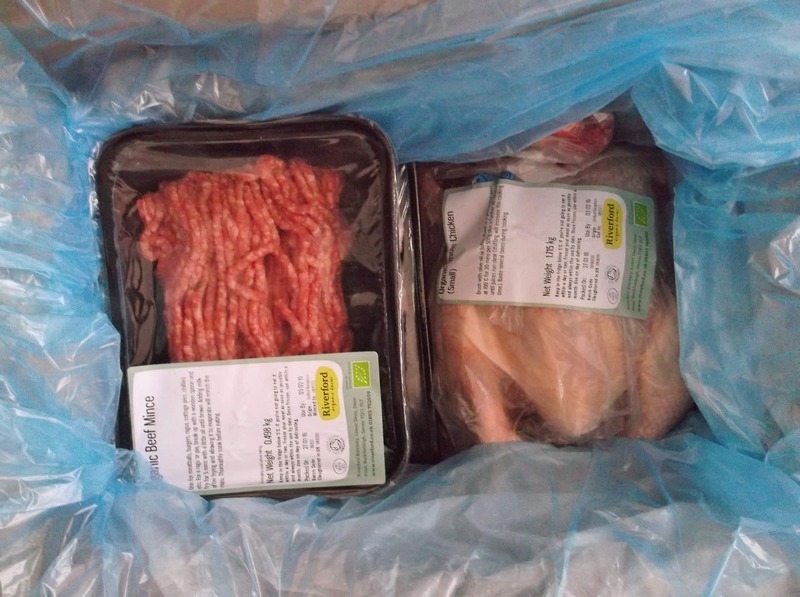 Meaning that if you are not in when your delivery arrives (or if you have it delivered to work), the meat will keep at a nice safe temperature until you get it into the fridge. And that was it. The only plastic was round the lettuce and there wasn’t a carrier bag in sight! There was only one substitution, my grapes had been replaced by a pineapple. Which for my family was actually a good thing as the kids prefer pineapple. Everything else was exactly how it was advertised on the website. I was really pleased with the quality. Everything looked really nice. Yes, the vegetables are slightly muddier and wonkier than you might expect from the supermarket, but buying from an organic box scheme, I think you’d be a bit disappointed if the vegetables were all shiny and clean and perfectly straight. And I was pleased with the quantities too. In fact I think my only minor gripe would be that there weren’t really enough potatoes for my family (only 1.5kg). But now I know what to expect, I will order more potatoes another time. Not only did I get all the lovely fruit/veg/meat that I was expecting, but I also got a lovely welcome pack, which included a welcome letter from my local delivery team, recipes, a newsletter about what has been happening on the farms and an A-Z vegetable identifier…very handy if you get a vegetable you’ve not met before! The first thing I did was to roast the chicken. I made a simple flavoured butter using garlic, thyme and lemon and smothered it all over the chicken and under the skin before roasting it in a hot oven for 1h15. Next I parboiled the lovely Maris Piper Potatoes before arranging them and the other root vegetables around the chicken. To go with the chicken and root veg, I followed a simple recipe from the Riverford recipe collection for Braised Chard with Garlic & Lemon. I also used the chicken innards (which came with the chicken) to make a very delicious stock to use to make gravy to go with the chicken. Not wanting to waste a thing, I (well my husband actually) stripped the remaining chicken off the carcass and then I boiled the chicken carcass for a couple of hours to make some delicious stock. 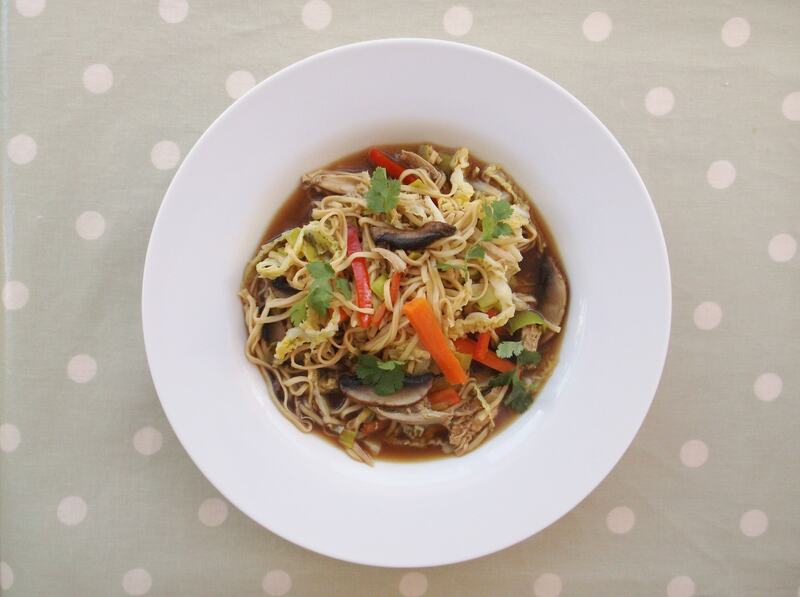 I used this stock, together with the left over chicken and some of the vegetables to make a delicious, healthy chicken noodle soup. I gave the soup a slightly Asian flavour by adding fish sauce, soy sauce, lime juice, coriander leaves and ginger. Next I turned my attention to the organic beef mince. 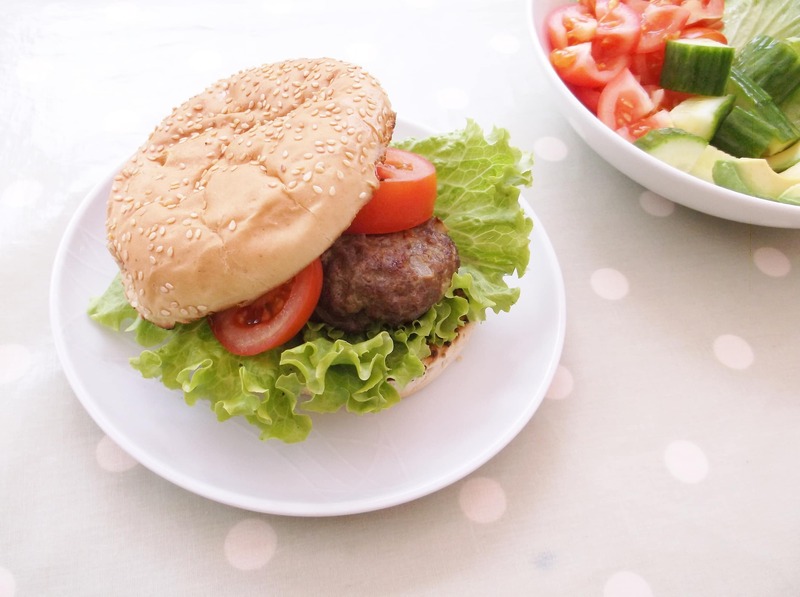 I added 1 chopped onion and 1 egg, plus a bit of salt and pepper and then shaped the mince into burgers. After chilling in the fridge, I cooked them under a hot grill before serving in toasted buns with some of that wonderful salad. I am a big fan of Asian flavours, so I decided to give the pork chops an Asian twist too. I started by marinating the pork chops in a combination of teriyaki sauce and lime juice before frying them on a high heat for 3 minutes on each side, till they were just cooked, but still juicy. While the Pork chops were resting I quickly stir fried some sliced pepper, carrots, savoy cabbage and mushrooms from my box together with a little chilli, garlic and ginger. I added in the leftover marinade and the resting juices from the pork, to make a simple sauce and then added some cooked noodles. With the rest of the vegetables I made a delicious vegetarian (and actually vegan too) tagine. I fried up a sliced onion, together with a sliced leek, added ginger, garlic, chilli, cumin and coriander. Then I tipped in my vegetables: potatoes, peppers and carrots from my veg box, plus half a butternut squash I had left over from the week before. To this I added 2 tins of tomatoes and a tin of chickpeas and simmered until the veggies were tender. 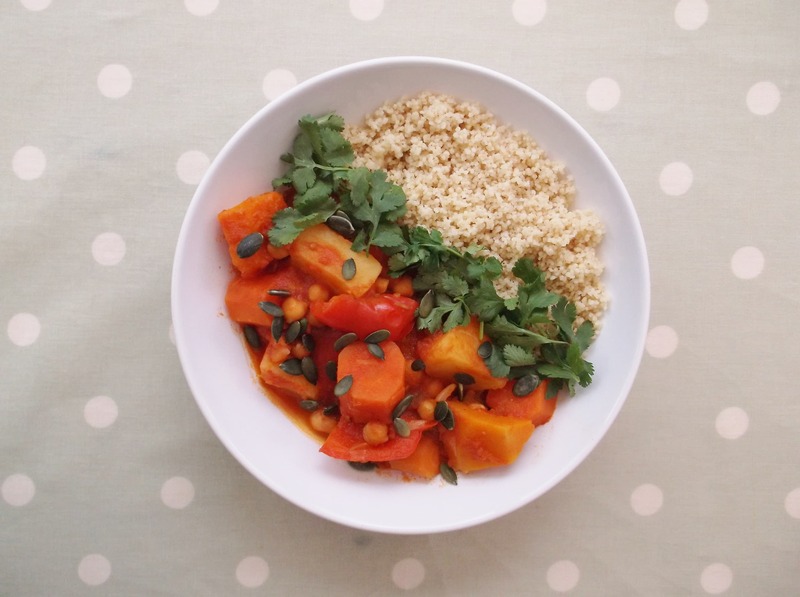 I served my tagine with wholewheat couscous and coriander – a lovely simple supper. The box I chose included apples, a pineapple and some bananas. The pineapple and apples we just ate as they were, but the bananas I turned into a delicious easy peasy banana bread. I used wholewheat flour to make it more healthy and using bananas meant I could cut down on the amount of sugar and fat too. I also chucked in a handful of mixed seeds for extra goodness. 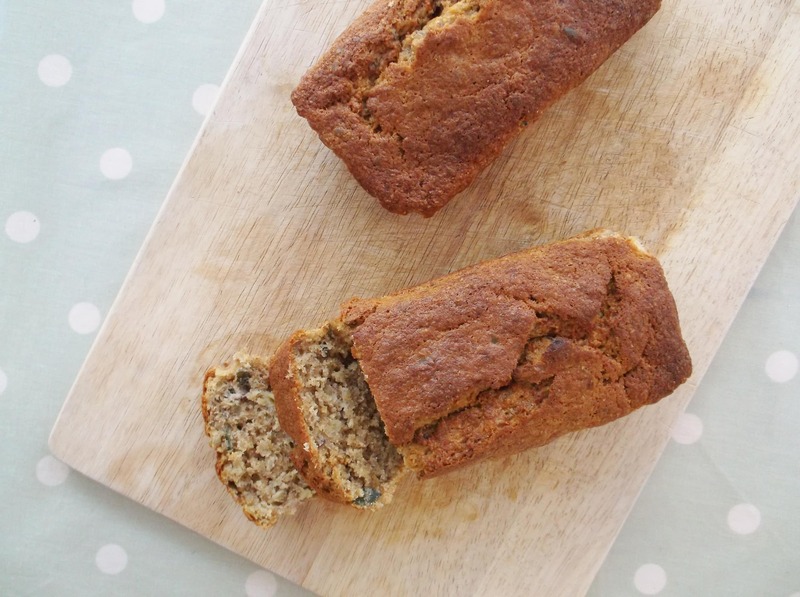 The result was insanely delicious – and quite possibly the best banana bread ever! How does it compare to buying from the supermarket? Unsurprisingly the produce from Riverford is of a high quality and much better than its supermarket equivalents. The things that particularly impressed us were the meat, the avocados and the apples. The only thing that disappointed us was the quality of the tomatoes – but then it is the middle of winter – hardly tomato season! It’s not a cheap option: the whole of my order was £59.69, about £10 more than buying similar things from the supermarket, but the quality was much better and I felt the whole experience was friendlier, more local, easier and more fair…with farmers being paid a fair price for what they produce and of course not having to conform to stringent supermarket standards. However, although the actual contents of the box were more expensive than buying equivalent food from the supermarket, my overall shopping that week was actually cheaper (I did also pick up a few bits from the supermarket to make the most of the box). I think this was probably because the box encouraged me to eat more seasonally (things in season tend to be cheaper), to use what I had more cleverly (such as making stock out of the chicken bones), to use up what I already had in my cupboards and fridge (thus creating less waste) and to eat more fruit and veg and less meat. Overall I probably spent about £15 less than I usually do. It was just like getting a supermarket delivery except you don’t have to unpack it all straight away. The downside is that you can’t pick a timed slot or even the day of the week but the website advises that you will usually get your delivery at roughly the same time every week. So if the day and slot work for you it’s not a problem. Very user friendly and a bit quicker than doing a supermarket shop (because you don’t have to order everything individually). Less choice, but in my world that’s actually a good thing. Being faced with a choice of 11 kinds of bread is so much nicer than the 778 options that Tesco gives me when I type bread into the search engine! The real benefit to buying from Riverford, or any other organic veg scheme for that matter, is that it encourages you to buy and eat more seasonally, to buy food as locally as possible, thus supporting local farmers and in a much more sustainable way. It also encourages you to eat less (but far better quality) meat and much more fruit and vegetables. Good for our health and health of the planet! The superior quality is also a big bonus. However, I also discovered a whole host of additional benefits: my whole shopping experience was actually easier than buying from the supermarket and my meal planning was much more fun. It was also a great education for my children who were very excited about the box and asked lots of questions – it enabled me to teach them a bit about where food comes from. Anything that gets kids excited about vegetables gets a big thumbs up from me! So what’s the downside…the downside is obviously the rigidity. You get less choice over what you eat as someone else (and the season) has chosen for you…this obviously means you are eating only food which is in season right now, but it does mean you can’t just have what you fancy…it means you have to be a bit more adventurous and rely less on recipes and more on making it up as you go along or else you have to go out and buy a whole load of stuff after your Riverford man (or lady) has been. It is also more expensive than buying equivalent food from the supermarket and of course it is less flexible with regards to delivery times and dates. 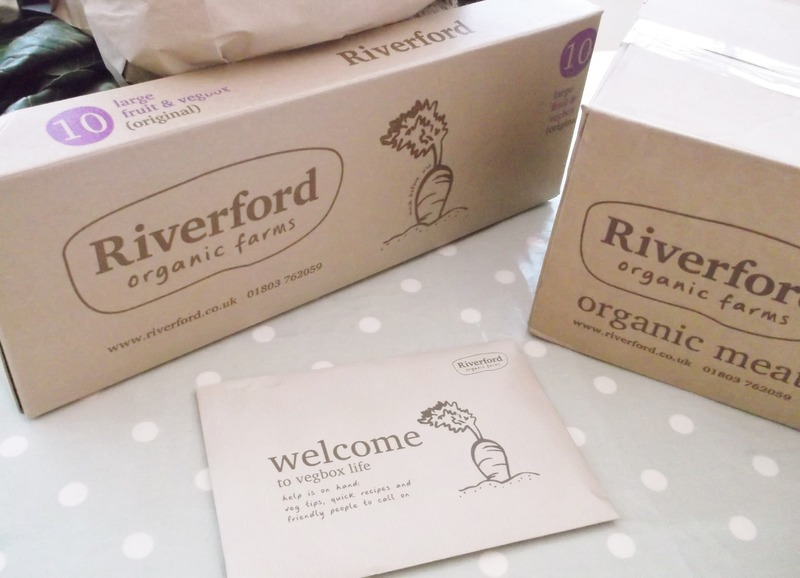 Will I be ordering from Riverford again? Yes, definitely. It was a really fun and positive experience and I would love to do it again. Sadly, my job as a food blogger means I can’t order one every week: I need a lot of flexibility in what I buy as every week I am testing recipes, photographing recipes, reviewing recipe books and trying new things out – all of which is unlikely to coincide with the box contents. I am also often planning recipes ahead of time, using products that will be in season in a month or two’s time BUT if I was not a food blogger I would definitely be placing an order for a regular box as I would like to be encouraged to eat more seasonally and organically and I would love to be able to support local farmers better. I would definitely like try Riverford again when I have a week without too many constraints. 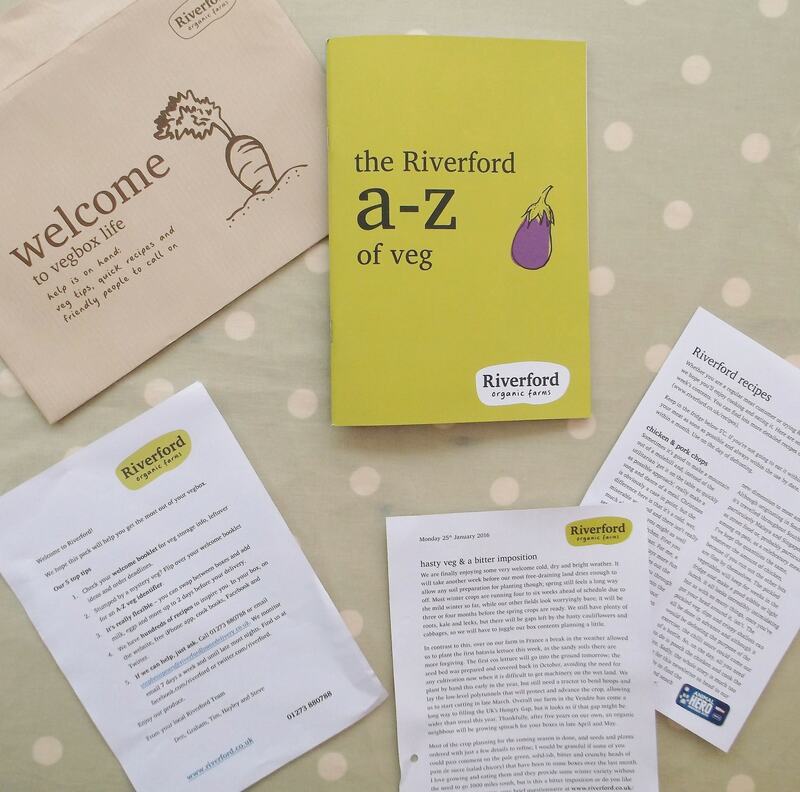 I would particularly like to try a Riverford box in the summer, when there will be more interesting and exciting fruit an veg in season…and hopefully better tomatoes! 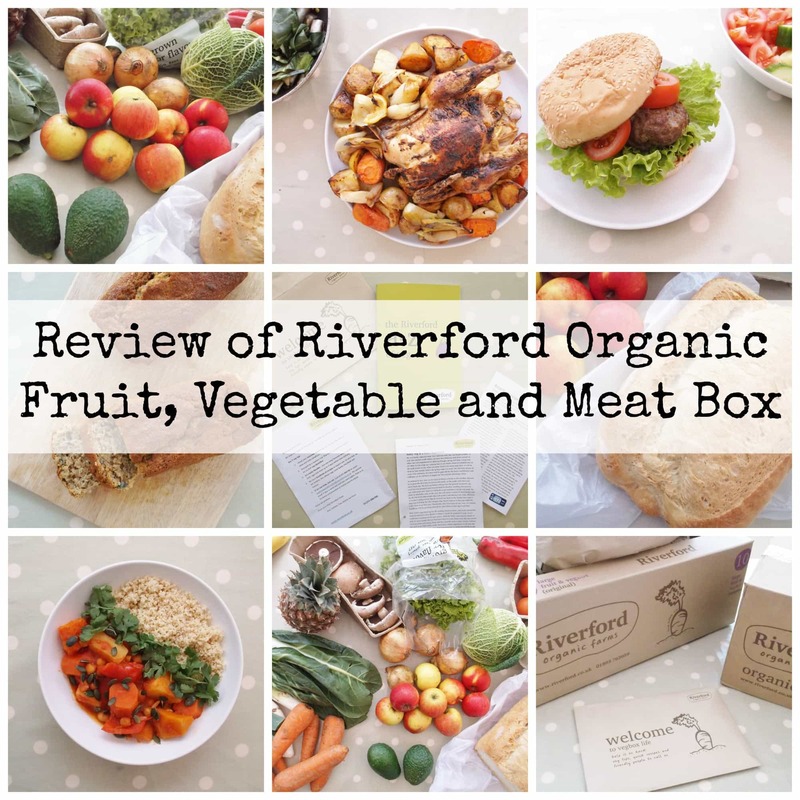 If you want to try a Riverford box, click here to be taken to the page where you can check if they deliver to your postcode or click here to go to the bit where you can see what each box contains. How about you? 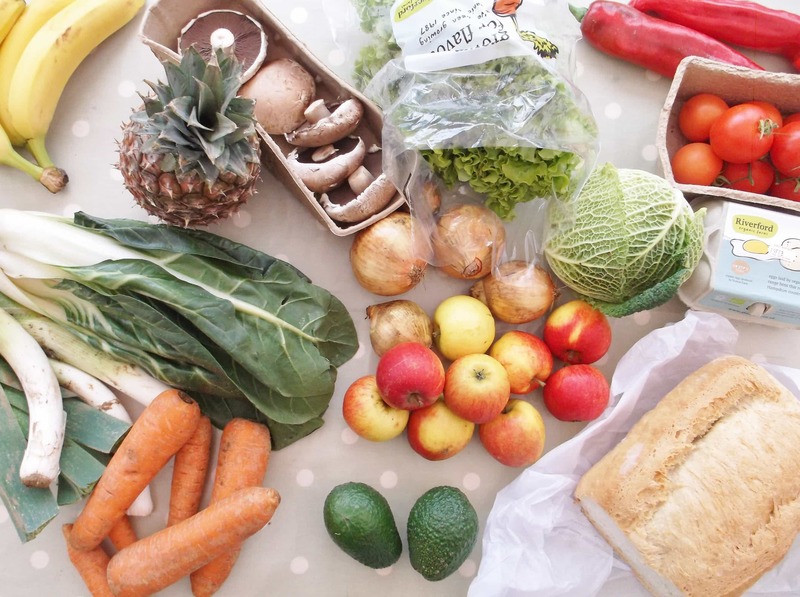 Have you ever bought an organic veg box from Riverford or another organic box scheme? How did you find it? Such an interesting and honest review Eb, especially as you spent less during the week on your shopping overall despite the box being that bit more expensive. 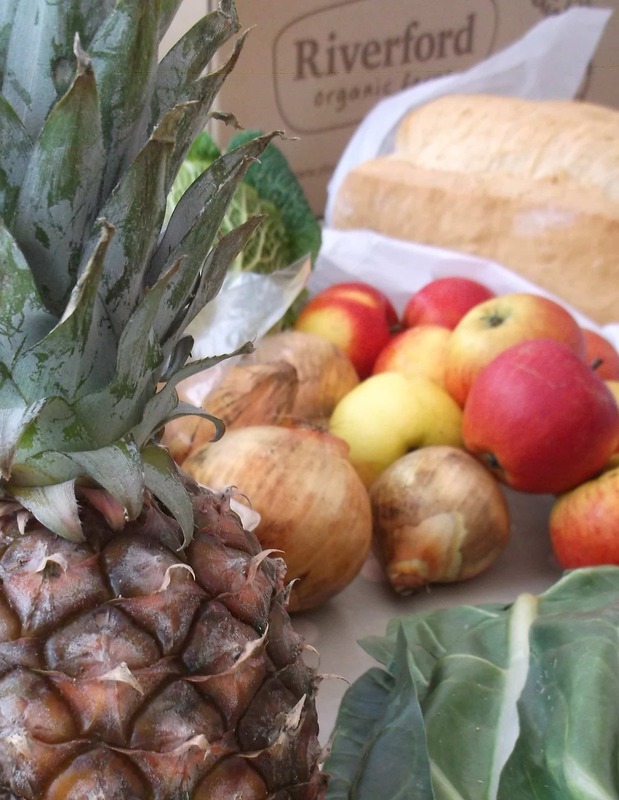 Your review comes just a couple of days after we had some representatives from another fresh fruit & veg delivery company (Able & Cole) knocked on our (and our neighbours) door. I must say I was seriously tempted to give it a go, given that the produce travels just a few short miles from the local farms; the representative made the point that everything would have been harvested no more than 3 days prior to its delivery to us (yet later in the conversation she talked about oranges and said that they were shipped in boats – I’m no sailor but I’d imagine that the oranges would take longer than 3 days to arrive at our door – just a small qualm I had). I love that the packaging was so much friendlier than the whole host of packaging we have from supermarkets. We too watched Hugh’s #WarOnWaste and found it incredibly annoying. It really highlighted the muscle power the supermarkets have these days. It’s disgraceful that we throw away perfectly good vegetables just because they are the wrong shape or size. The second episode where Morrisons ran a trial of a grade1 against a grade2 vegetable was so floored …the grade2 veg were clearly significantly older than the grade1 which they obviously wanted to stock! And how shocking that they didn’t want to be interviewed with the farm who then went out of business. Did you find you had enough to feed all of you for the full week from the box? Thanks, Tim! We got the large fruit, veg and meat box which was enough to feed the four of us for 5 main meals and 2 lunches with plenty of salad and fruit to last us the whole week, plus I made a cake out of the bananas and eggs. But it did need a bit of supplementing: I bought things like noodles, rice, flour and butter (for the cake), and flavourings like citrus fruits, garlic, herbs and spices. But I was pleasantly surprised that when I added up my two receipts (one from Riverford and one from Tesco) that I had actually spent less than I usually do!